There is no shortage of amazing Amazon LOreal products! Did you know that drugstore makeup on Amazon is oftentimes cheaper than in stores? I was pleasantly surprised and have actually been doing a lot of my drugstore makeup there! 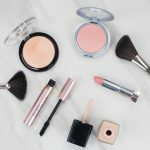 I’ve got a few other blog posts on this topic – The Best Drugstore Makeup on Amazon and 101 Cheap Beauty Products Makeup Lovers Can’t Live Without. Make sure you check those out before doing all of your Amazon shopping! L’Oreal is a classic drugstore brand that I’ve loved for as long as I have worn makeup. Along with classic favorite items, they’re always releasing new and innovative products. I appreciate the longevity of this brand! So many of my favorite products. Here are 15 L’Oreal Products to Grab on Amazon! I limited this list to mostly makeup products, because y’all know that makeup is my jam. If you’re interested in more affordable hair and skincare favorites, let me know! I’ll be sure to work on another post. L’Oreal Lash Paradise Mascara // Holy grail mascara right here! I have lost count on how many I’ve gone through. L’Oreal Voluminous Carbon Black Mascara // This is a cult classic mascara that is loved by so many people. It’s so good! L’Oréal Paris Makeup Double Extend Beauty Tubes Lengthening Mascara // If you like mascaras that have primers on the other end, you’re going to love this one. This is incredible at lengthening! L’Oréal Paris Makeup Voluminous Mascara Primer // I thought it seemed silly to use a mascara primer until I tried this one. It really does help make your lashes pop even more! L’Oreal Paris Cosmetics True Match Lumi Glotion Natural Glow Enhancer // I have loved using this almost like a primer, underneath my foundation. It gives the skin a nice glow without it looking glittery. L’Oréal Paris Infallible Pro-Glow Foundation // One of my top foundations of all time. The formula on this is a thin consistency with a natural finish. It doesn’t get super dewy in my opinion, but it doesn’t look matte. It’s just gorgeous! Best of all, it stays put all day. 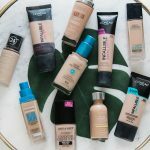 L’Oréal Paris Makeup Infallible Pro-Matte Foundation // If you like a matte full coverage foundation, you will love this! It also stays put all day. L’Oreal Paris Cosmetics Infallible Total Cover Color Correcting Kit // If you are into color correcting, no need to pick up a pricey palette from a high-end retailer. This one gets the job done and is affordable! L’Oréal Paris Makeup Brow Stylist Definer Waterproof Eyebrow Pencil // If you’re a fan of the Anastasia Brow Wiz or any of those other tiny micro brow pencils, this will be your jam. I love it! L’Oréal Paris Makeup Infallible 24HR Shadow // The formula on these eyeshadows are absolutely stunning. They’re almost like pressed pigments – they have a super metallic finish. Amber Rush and Iced Latte are cult favorites among drugstore makeup aficionados. L’Oréal Paris Lineur Intense Felt Tip Liquid Eyeliner // An oldie but a goodie liquid liner. Can’t go wrong with this one! L’Oréal Paris Makeup Colour Riche Shine Lipstick // This is one of L’Oreal’s newer releases and I just love the formula of this lipstick. It’s shiny and buildable, and super comfortable to wear. I also love the packaging. L’Oréal Paris Infallible Pro-Spray + Set Make-Up Setting Spray // This setting spray really gets the job done. I loooove the mister on it, as well. L’Oreal Paris Elnett Satin Hairspray // This hairspray is loved by all and for a good reason. It holds your hair but you can completely brush through it and it will not flake. Make sure to get the unscented version to avoid smelling like grandmas as much as possible. L’Oréal Paris Makeup Infallible Blend Artist Makeup Blender Sponge // This is a fantastic blending sponge! It’s a little more dense than the beauty blender, but I love how it performs. What are your favorite L’Oreal products? Let me know in the comments! If you loved this blog post on drugstore makeup, be sure to check out some of my other ones! Or browse all of my drugstore & dupes blog posts HERE!